Here is a statement from presidential candidate Tulsi Gabbard where she pretty much says that Benjamnin Netanyahu is pushing for the US to go to war with Iran - and Russia! - to start World War III. I've always supported Israel's right to exist even more so after I had the opportunity to visit the Auschwitz concentration camp in 2005. That's why I'm so concerned with Bibi Netanyahu who's aggressive annexation policies which are simply going to stoke the flames of resentment and conflict. This is bad for Israel, bad for the United States, Palestinians and the region. Netanyahu and Saudi Arabia want to drag the United States into war against Iran and Trump is submitting to their wishes. The cost in lives and money will be beyond our imagination. other urgent needs that we have. It'll also lead to many more of our troops paying the ultimate price, sacrificing their lives and increasing death and suffering of people in the region this will increase tenfold the present refugee crisis that Europe is facing and could even lead to direct conflict between the United States and Russia which could quickly leads to nuclear conflict that would mean the end of the world as we know it. This is an existential threat that requires every American to stand up and say no. To put it bluntly, this is insanity. First of all, Israel didn't annex the Golan. Trump's declaration recognizing Israel's rule over the Golan didn't change anything. The Arab world put out some obligatory statements and yawned. To throw Trump's declaration into a list of things that will upset Palestinians and make peace less likely is a head scratcher. True, Islamic Jihad and Hamas have denounced the move, but they aren't exactly peace partners. To claim that designating the IRGC, which everyone admits has killed hundreds of Americans, as a terrorist organization is Bibi bringing the US to war with Iran is a fever dream of someone who hates Netanyahu and Trump so much that no accusation is over the top. And to say, with birds chirping in the background, that not only will Israel's actions lead to US war with Iran but also to war with Russia is completely nuts. Why, exactly, would Russia intervene? Gabbard doesn't say. She assumes an Israel that is directing US policy with no ability of the US to resist doing things against its own self interest. Israeli Jews must be hypnotizing the world again. Those Jews can convince a superpower to ignore infrastructure, education and health care and instead start a nuclear war on its behalf. Notice that she is not denouncing Trump. In her mind, Bibi is calling the shots and Trump is obediently listening to him - because Trump is a wild uncontrollable bully in evry other aspect of his policies but a slave to the Zionists. 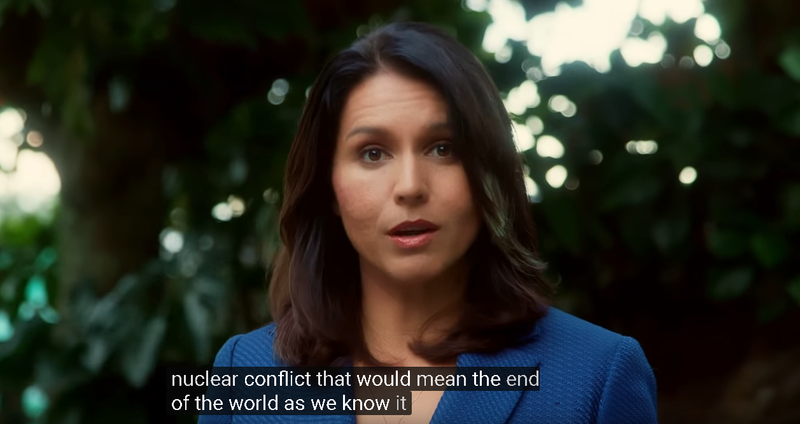 Notwithstanding her invoking of Auschwitz as a reason for Israel to exist (self determination of the Jewish people is apparently not a good enough reason,) Gabbard is implying that the Israelis, by likely electing Netanyahu, are warmongers who for some reason want World War III - which would incidentally destroy Israel. This is the Ilhan Omarization of the Democratic Party. And there are not enough prominent Democrats who are willing to go out on a limb and say that this kind of accusation is not only wrong and ignorant but it gives comfort and ammunition to real antisemites.